4th year Pic 220 - Sep - 25 2012. Princess Anika! 1st birthday! On 16th Anika finished one year! Both sets of grandparents and close family members went for lunch. 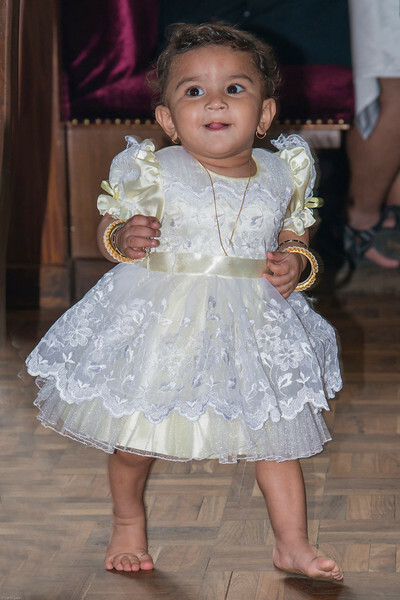 Anika, dressed like a princess, tossed off her shoes, ran about bare-feet and played with all those present at the restaurant and outside it. We cut a little cake with her and the birthday girl was happiest to be fed all that yummy chocolate by all of us. In all, a thoroughly enjoyable and memorable fuss-free celebration, where Anika the star was just as she's been all this year — happy, excited and playful. Critiques welcome! She's so beautiful! Such a sweet and joyful spirit! wow, time flies ! very cute, sounds like great fun ! So much better without shoes, a smart little lady. So happy and pretty! Oh my goodness, where has the past year gone! Happy belated birthday Princess Anika! Awwwww, such a sweet photo. I know you are enjoying this time with her. A princess indeed!!!! Beautiful little angel!!! Such a darling little Princess she is! Wonderful shot, Harsh... can't believe she's a year old already...! !